Air pollution can have both man-made and natural sources. The Eyjafjallajokul volcano in Iceland and Mount St. Helen in Washington illustrate the effect of natural causes of air pollution. However, humans continue to negatively impact their environments and contribute to air pollution. Air quality reports and ozone alerts indicate that air pollution can have serious health consequences. Despite the best efforts, total emissions of greenhouse gases increased 17 percent during the years 1990 to 2007, according to the U.S. State Department's report, Inventory of U.S. Greenhouse Gas Emissions and Sinks: 1990–2007. The report specified that these emissions are anthropogenic, or man-made. This represents a direct impact of human activities on air pollution. Sources include industrial activities, agricultural soil management and vehicle exhaust. The primary cause for the increase in atmospheric carbon dioxide is fossil fuels, according to the Intergovernmental Panel on Climate Change. This trend coincides with the increase in industrial activity since the Industrial Revolution. The report further goes on to attribute the increases of atmospheric methane and nitrous oxide to agriculture. Both of these contributions also correspond with an increase in the human population during this same time period. Ironically, we are affected by the man-made air pollution we cause. Ground-level ozone is caused by a concentration of greenhouse gases at the earth's surface. If you breathe ozone, you are likely to suffer throat and lung irritation. If you have asthma, you may find your attacks come more frequent and more intense. A 2002 study published in the Journal of the American Medical Association found a direct link between long-term exposure to air pollution and lung cancer and other respiratory conditions. The effects of human-caused air pollution are not limited to people. Acid rain, for example, is formed when emissions of sulfur dioxide and nitrous oxide combine with moisture in the air to create acidic precipitation. This acid rain can acidify lakes and soils. It can also cause structural damage to buildings and monuments, especially those made of limestone or marble. Many of the historic structures in Washington D.C. are vulnerable to the destructive action of acid rain, with the U.S. Capitol Building itself showing signs of damage. Just as people have caused an increase in air pollution, so too can they mitigate its effects. Sulfur dioxide emissions, for example, have been significantly reduced in part due to revisions of the Clean Air Act of 1971. 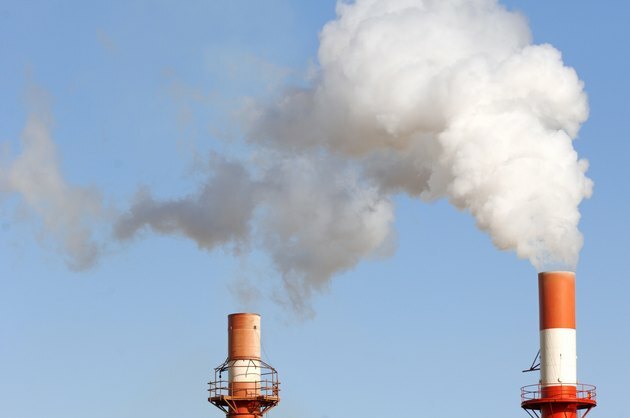 Installation of scrubbers on smokestacks has contributed to a more than 70 percent reduction in sulfur dioxide emissions during 1980 to 2008. Perhaps similar provisions can reduce other greenhouse gases and reduce the environmental impact of air pollution.